Home » Hamilton Flexbrew vs Keurig Models: Which One Will You Like More? The Hamilton Flexbrew vs Keurig models could be an easy decision for you or a difficult one, depending on what you’re looking for. They both make coffee by the cup or carafe, but there are some differences between the two that may make one model and break the other one for you. 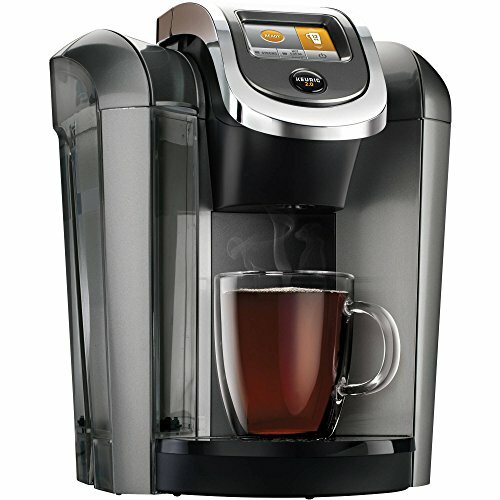 There are a few Keurigs that could compare to the Flexbrew, so I’ll break those down individually as well. Hamilton Flexbrew vs Keurig Models: Which One Wins? What Do They All Have? 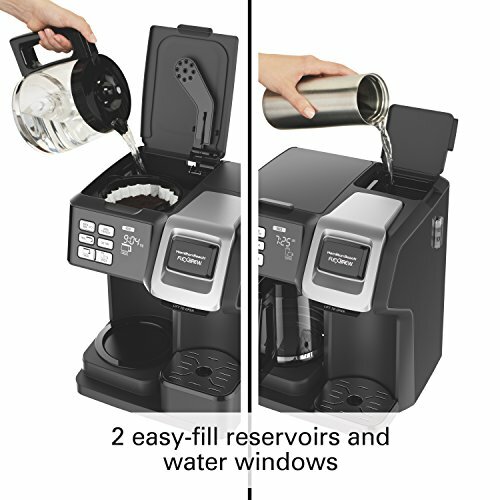 The Hamilton Flexbrew is an affordable option for making single cups of coffee or a full carafe. It’s a pretty basic design that gets the job done. Brew a carafe or a single mug of coffee. You can choose whether to make your coffee bold or regular strength. Each brewer has its own water reservoir. Use the pause and serve feature to pour a cup of coffee before the whole pot has finished brewing. It shuts itself off after two hours but it keeps your coffee warm until then. There’s a removable cup rest that also works as a storage area for a brew basket or single-serve packs. You can use K-Cups for single cups up to 10 ounces or your own grounds for a travel mug (14 ounces). Yep, that means you can choose to make your coffee from pods or ground coffee—even if you only want one cup. It’s easy to clean, even the part that pierces the K-cups (it’s removable). It’s slim so it’ll fit on the counter without taking up too much space (13.9”H x 10.24”W x 10.63”D). It works with Melitta #1 small paper filters. It comes with the carafe so there’s no additional expense. You can use K-Cups, but you don’t have to. 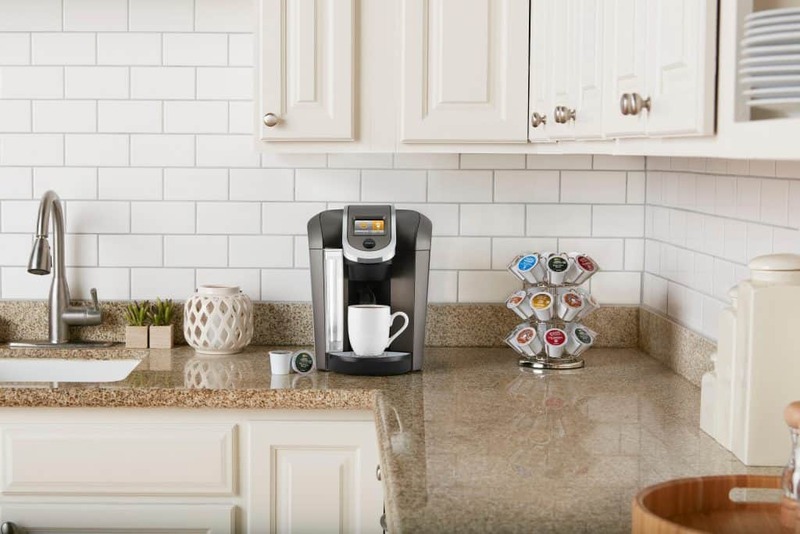 You can use your own grounds (you can do this with the Keurigs too, using their reusable pods, but some of the Keurigs limit which pods you can use). It’s the least expensive option. You don’t get a lot of bells and whistles; it’s a pretty simple programmable design that allows you to make regular coffee by the cup or the pot. It’s not the sleekest or most interesting model to look at, so if you’re big on kitchen aesthetics, you will probably want to at least consider other options before buying this one. There’s just one model to choose from, so there aren’t options with more or fewer features the way there are with Keurig. There are a few Keurig models that are comparable to the Hamilton Beach Flexbrew. Some come with a list of additional features that may make it worth the upgrade, depending on your needs. 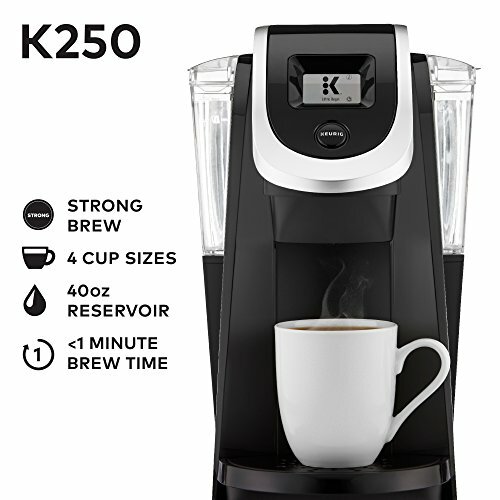 The Keurig 250 is one of the closest models to the Hamilton Flexbrew. You can make a single cup or a carafe with it. The Keurig 250 has a slim design that means it won’t take up a lot of space on your counter (dimensions are 13.7”H x 9”W x 15”D). There are over 500 varieties of coffee, tea, and specialty drinks you can purchase for this machine. You can count on a one-minute brew time for cups of coffee. It has a 40-ounce reservoir. There’s a 2-inch black and white touch display screen. Choose from four different cup sizes—4, 6, 8, or 10 ounces—or three carafe sizes (22, 26, or 30 ounces). You can use K-Cups, K-Pods, or K-Mugs with it. It uses a Keurig® 2.0 My K-Cup® Reusable Filter. There is a high altitude setting. You can set your preferred language. You’ll be able to control the strength of the brew. It comes in a lot of different colors: Imperial Red, Black, White, Sandy Pearl, Turquoise, Peacock Blue, Plum Gray, and Oasis, so it’ll go beyond just blending in with your kitchen décor. You can get one that matches other colors in your kitchen or use it as an accent color. 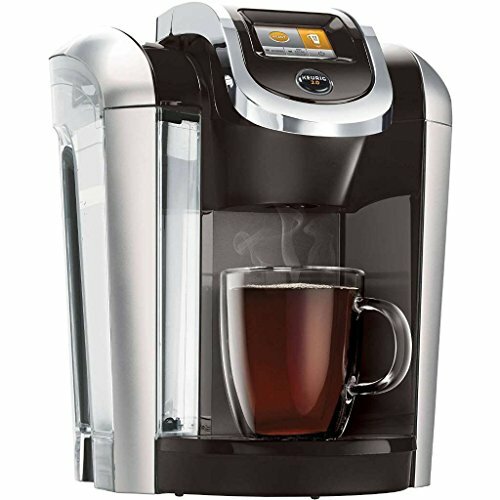 It’s one of the less expensive Keurig models at around $130.00. It costs more than the Hamilton Flexbrew—almost double. You can only use Keurig 2.0 pods with this machine, which could make it more expensive to use overall. The carafe is not included with the brewer, so if you want to make pots of coffee, you’ll need to make an additional purchase. That means spending more money (about $20.00 or $30.00, depending on the carafe and where you purchase it). The K425 is another comparable model to the Flexbrew, but it’s an upgrade from the Keurig 250. It’s slim so it’ll fit on most counters. The dimensions are 13.2”H x 10.5”W x 13.3”D. You can customize the brew strength and control the temperature. The reservoir holds 70 ounces. It has a color touchscreen display that’s 2.4”. You can use K-Cups, K-Mugs, or K-Carafes. Make 4-, 6-, 8-, 10-, 12-, or 16-ounce cups of coffee or a 22-, 26-, or 30-ounce carafe. It comes in black or vintage red. Auto off/on makes it easy to brew coffee right when you want it and not worry about going back to shut off the machine. It has an illuminated reservoir. It makes a drink in less than a minute. It’s still pretty affordable at about $140.00. It gives you several options in cup sizes, pods you can buy, and the option of carafe. You get a lot of control over your cup of coffee, based on size, strength, and temperature. You can use a K-Cup Reusable Filter with it to make your own ground coffee. It still costs more than the Hamilton Flexbrew, even though it’s pretty affordable. The carafe is not included, so you’ll need to spend another $20.00 or $30.00 to get the full use of the machine. This one’s slightly more advanced than the other two models, but worth a look when you’re considering the Hamilton Flexbrew as well as other Keurigs. You can brew a drink in less than a minute. You have tons of options for drink sizes: K-Cup brew sizes are 4, 6, 8, 10, and 12 ounces. Vue Pod brew sizes are 12, 14, 16, and 18. K-Mug sizes are 12, 14, 16, and 18. K-Carafe sizes are 22, 26, and 30. There are five temperature settings. You can get hot water on demand. There’s a high altitude setting. It has a large color screen to make the process of making a beverage even easier. It has energy saving mode. You can even use it as a nightlight for your kitchen. You can use the K-Cup reusable filter with it. It’s possible to save your favorite settings so you get just the drink you want, every time, with ease. It’s thin and light at 13.2”H x 10.5”W x 13.3” D and 10 lbs. It has an 80 oz. reservoir. It’s easy to use and programmable, so it saves your preferences for later. The extra features—like its ability to light up your kitchen at night—are a nice touch. You have even more choices in the beverages you make and pods you can use. It’s one of the more expensive options at around $180.00, but you do get quite a few extra features. Unless you’re using your own coffee in a reusable pod, it could be expensive to use daily. The pods from Keurig aren’t always the most cost-effective way to make your daily coffee, even if they’re one of the most convenient. Now it’s time for the Hamilton Flexbrew vs Keurig models showdown. Is there a clear winner? Maybe, maybe not. It really boils down to which brand you trust more, aesthetics, and extra features. At their core, they’ll do the same things. 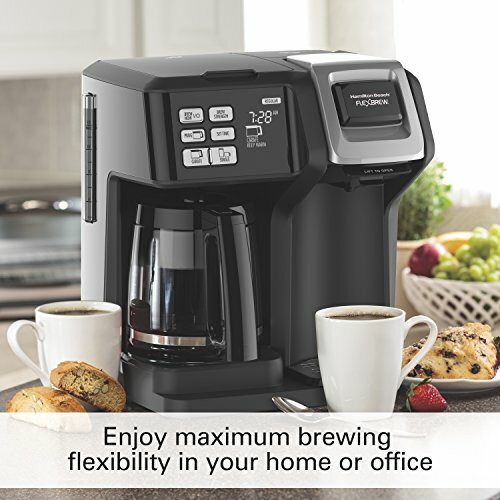 You may find that you get a little more flexibility from the Hamilton Beach model simply because it doesn’t only take specific K-Cups. You will be using ground coffee in the Flexbrew no matter what since it doesn’t accept K-Carafe pods. You’re slightly more limited with the Keurig machines (especially 2.0 models), though you can get a reusable cup and choose your own ground coffee, whether that’s from the grocery store, online, or a local roaster. It won’t matter as long as the Keurig can read the pod. The Hamilton Flexbrew wins on this one simply because the carafe comes with the machine. They don’t expect you to buy the machine with a gaping hole where the carafe should go, only to have to buy another piece for a complete set. In all fairness, the Keurigs don’t have a designated spot just for a carafe so if you don’t get one and simply make coffee by the cup, this may not even be an issue. They’re all about the same size, so unless you have a very specific amount of room for your new coffee maker, the size probably won’t be the deciding factor for you. How often do you make a carafe of coffee, and when you do, how many ounces of coffee do you need? How much does refilling a water reservoir bug you? Do you want to fit as much water as possible in there, just so you don’t have to refill often? Do you like the way the two options look side-by-side (Flexbrew) or do you prefer to rotate out the mugs and carafes as needed (Keurigs)? How important are aesthetics in your kitchen, and is there something about a specific Keurig model (like a color touchscreen, special color of the machine itself, or nightlight setting) that you really like? Do you like it enough to pay extra for it? How many cup sizes do you want to be able to accommodate? What can you afford (don’t forget to take the extra cost of the Keurig carafe into account if you need one)? Any model will get the job done. Decide which special features are in your best coffee machine. The Flexbrew is the least expensive but also the least advanced in style and performance. The Keurigs cost more and don’t do much to make the coffee-making experience itself that much different, aside from how many ounces of coffee you can choose to make. Previous Post: « Baratza Forte vs Mazzer Mini Grinder Comparison: Which is Best?